I recently wrote an article for a magazine about the science of food cravings. Without giving too much away, one of the many interesting things I learned was just how powerful cues in our environment are for triggering cravings. So while you might think that a desire to eat a certain food appeared out of nowhere it can almost always be traced back to something you recently saw, smelled, heard, felt, or thought even if you weren’t aware of it at the time. Since writing that article I’ve tried to become more attune to where my urges to eat certain foods originate. I’m not interested in controlling cravings (there’s no food that I consider to be off-limits or bad), but I think that understanding cravings is just another step toward building a stronger awareness of my body and mind. So when I experienced a sudden and very clear urge to cook and eat fish tacos last week I was instantly able to trace it back to a conversation I’d had several days earlier with a friend from yoga teacher training. (Oh, by the way, I’m currently doing power yoga teacher training (!!!) which explains why I’ve been MIA from here and from my kitchen lately.) But I didn’t want to eat just any fish tacos–I wanted fish tacos that had multiple layers of flavors and textures (like what you’d find at a restaurant) and this meal provided exactly that. I like to say it’s a Paige Special since I pretty much winged it. I loosely based the recipe on one my sister and I came up with via e-mail last summer when I made tacos on the grill outside with mahi mahi. But this time I used tilapia because it was cheaper and cooks more quickly–perfect for after a full weekend of yoga classes and training when you’ve got one night to relax and a full DVR. 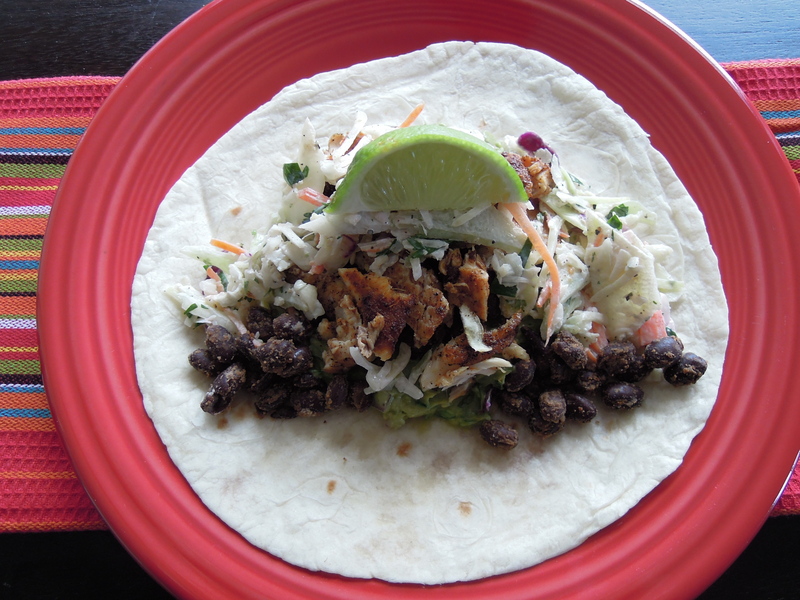 What I love about this recipe is that most of it’s homemade: I made my own spice rub for the fish, my own guac, my own slaw (though I started with a bag of chopped cabbage), and even my own spiced beans. One day I’d love to make my own tortillas, but for the sake of time I used store bought. This recipe allows for lots of leftovers so after the first night I skipped the tortilla altogether and piled everything on top of chopped romaine lettuce for a fish taco salad, which is one of my favorite things ever. Between the spices and the bright flavors of the cilantro and lime I felt like this meal was a little preview-taste of spring. I’ve started to realize just how endless the potential combinations are when it comes to fish tacos and I’ve already begun dreaming up different combinations of fish, spices, and toppers. P.S. If you find yourself randomly thinking about fish tacos during your day I’m pretty sure I know why. Combine spices in a small bowl. Heat skillet over medium-high heat. Pat fish dry. Brush one side with olive oil and sprinkle 1 tsp of spices evenly on each filet. Cook spiced-side down. Brush the opposite side with olive oil and sprinkle with 1 tsp of spices. Cook until slightly blackened about 3-5 minutes on each side. Remove from heat and set aside. Using the end of a spatula or a knife, gently flake fish into small pieces. Combine beans and spices in a small saucepan. Heat over medium-high, stirring occasionally, until beans are heated through. Remove from heat. To assemble tacos spread a layer of guacamole in the middle of a heated tortilla. 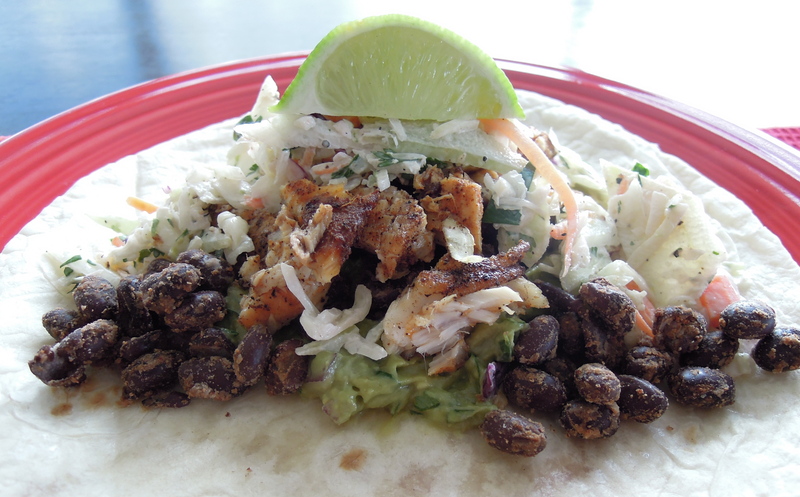 Top with beans, fish, and slaw. This entry was posted in Fish on March 11, 2012 by Paige Greenfield.